The Socialist Party is the only council group to have declared a consensus, with all three councillors planning to vote Yes. Ruth Coppinger said while there was “no appetite” for the mayoral proposal, the party did not want to block Dubliners from voting. …many thanks to the person who forwarded these. This from Kathy Sheridan in the Irish Times. And this from Eoghan Harris in the Sunday Independent. …some strange one’s in the UK. In the wake of the Budget it appeared that the Labour lead was dipping – in some instances significantly. And yet, and yet, the extremely good UK Polling Report notes that there remains a projected Labour majority of 32 – which is down and the average is 37 for the LP and 34 for Tories with 10 for the LDs. This weekend brought two polls, one from the Observer which had Con 32, Lab 33, LD 10 and UKIP on 15, and another from the Sunday Times which had Con 33, Lab 40, LD 9 and UKIP 11. UK PR also reflects on the figures on the European Election voting intentions from the ST where tellingly, “CON 24%, LAB 32%, LDEM 11%, UKIP 23%, GRN 5%.”. Difficult not to think that that reflects a clearer assessment (in terms of distance between LP and Tory) than the headline figures seen elsewhere given that the Euro’s are imminent – though it also points up the danger for the LP that much of its vote can be ‘captured’ as it were. 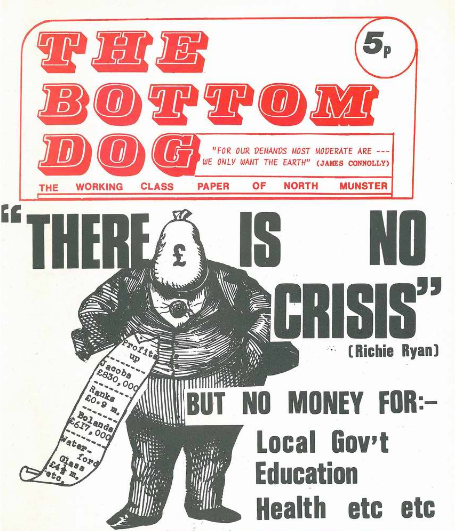 Posted by WorldbyStorm in Communist Party of Ireland (Marxist Leninist), Irish Left Online Document Archive. These documents from the CPI (M-L) are in some respects curious. They lack the clear newsletter format used by that party for much of its other documentation and instead are very text heavy. They are also in a four page A4 format with an additional double sided A4 leaflet. They consist of a long piece on Reagan entitled ‘Fascist Warmonger, Get out of Ireland!’ with additional articles. These latter encompass a range of issues, including ‘U.S. 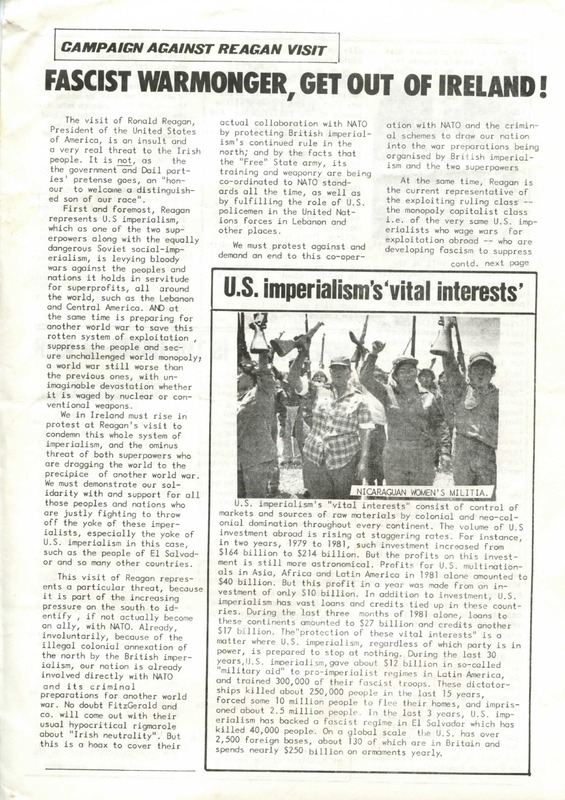 imperialism’s ‘vital interests’’, ‘Imperialism is the cause of war’, ‘USSR- also an imperialist aggressor and exploiter’ and ‘Oppose Both Superpowers and All Imperialism! Throw British imperialism out of Ireland!’. The visit of Ronald Reagan, President of the Untied States of America, is an insult and a very real threat to the Irish people. It is not, as the government and Dail parties pre tense goes, an ‘honour to welcome a distinguished son of our race’. First and foremost, Reagan represents U.S. imperialism, which as one of the two superpowers along with the equally dangers Soviet social imperialism, is levying bloody wars against the peoples and nations it holds in servitude for super profits, all around the world, such s the lebanon and Central America. AND at the same time is preparing for another world war to save this rotten system of exploitation, suppress the people and secure unchallenged world monopoly; a world war still worse than the previous ones, with unimaginable devastation whether it is waged by nuclear or conventional weapons. We in Ireland must rise in protest at Reagan’s visit to condemn this whole system of imperialism, and the ominous threat of both superpowers who are dragging the world to the precipice of another world war. We must demonstrate our solidarity with and support for all those peoples and nations who are justly fighting to throw off the yoke of these imperialists, especially the yoke of U.S. imperialism in this case, such as the people of El Salvador and so many other countries. …fight to avert the danger of another world war on the following principled basis. 3 Throw British imperialism out of the north! Posted by Oireachtas Retort in Class/Class politics, Irish Politics. …now digitised & available online here. More admirably, and perhaps more daringly, Leo has been an unashamed champion of the middle classes, and has even admitted to being middle class himself. That’s braver than you think in this country. Right now, it’s very easy to talk about the poor downtrodden and the marginals and all the poor unfortunates. But being middle-class is more unfashionable than ever, and speaking up for them is even more so. But Leo Varadkar has consistently spoken up for the middle classes on issues of taxation, pointing out to John Drennan in this paper that the middle classes are ultimately the ones who pay the bills for social protection and all the other officially recognised good causes. He is also well aware that the middle classes are the engine of the domestic economy, with his great phrase, “Millionaires spend their money on yachts, the middle classes spend their money in shops”. He has cautioned against making property tax a tax on living in Dublin, though he did not stop it from becoming one. He has even made the verboten suggestion that the middle classes are the ones who were hardest hit by this recession. All of which suggests that Leo Varadkar is reasonably comfortable with who he is, and not ashamed of it, and not ashamed to say things that might not play well to RTE or the Irish Times. And in a way, what Leo Varadkar did last Thursday week epitomised the kind of decency we would like to associate with middle Ireland. …here from Adrian Kavanagh on Political Reform. The Sunday Business Post-Red C poll (30th March 2014) estimated party support levels as follows (and relative to the previous such poll): Fine Gael 26% (down 3%), Fianna Fail 22% (NC), Sinn Fein 21% (up 5%), Labour Party 9% (down 2%), Independents, Green Party and Others 22% (NC). My constituency-level analysis of these poll figures estimates that party seat levels, should such national support trends be replicated in an actual general election, would be as follows: Fianna Fail 36, Fine Gael 49, Sinn Fein 33, Labour 8, Independents, Green Party and Others 32. Usual caveats apply, not least that the election isn’t going to be this week. But isn’t it striking how SF is, in this poll at least becoming one of the big three in terms of potential seat numbers. Personally I tend to the view they will be closer to twenty plus seats and that’s a significant figure in and of itself suggesting that their niche on the political spectrum is expanding. But as shea noted in comments under the earlier piece on the poll, look at the Independents and Others. 32 seats. Remarkable (and consider too that in 1969 there was one Independent elected to the Dáil). It speaks of enormous potential there for those in that category. And then there’s the LP, beaten back to near-historic lows. That would certainly be some legacy the current leadership had handed them. Even putting aside the deviation between the eventual election and this poll what of the pressures this subjects the government parties to, in particular the LP? Every month and every new poll that comes out forecasting electoral disaster is one that places them in an increasingly more difficult position. For all the rhetoric about this Government falling over the Shatter/Callinan issues it seemed highly unlikely that that would be the outcome. But even if ‘politics as usual’ has taken over from the economic narrative that merely highlights how almost random events can and will destabilise this administration as we draw closer to the election – though expect no end of scare-mongering in the next twenty four months from that quarter about political instability and the dangers of SF, Independents and smaller parties, etc. And it’s not just politics as usual, with further cuts of €2bn plus to be made at the end of this year and austerity effectively in perpetuity on the menu. Small wonder SF and Independents and Others are doing so well and that the combined SF/Ind/Other vote is now at 44%. That’s not a left vote in its entirety, and the left bits probably aren’t for the most part all that left, but it speaks of a significant tranche of opposition to the status quo and the orthodoxy. Just out, and what’s this? The latest opinion poll shows support for the Government parties has dropped to its lowest level since the Coalition took office in March 2011. FG 26% [-3], LP 9% [-2], FF 22% [NC], SF 21% [+5%], IND/OTHERS 22% [NC]. The movement, such as it is is all margin of error stuff bar SF (and FG?). That’s interesting that they should do so well. But it hardly is surprising that the events of the last fortnight and before should cause problems for the government (and intriguing that FF’s recent shindig hasn’t reaped any rewards, at least not so far). One wonders if they regret not dealing more decisively from the off and telling people where they’d run out of road. Telling too that the Ind/Other category remains rock solid. Closing fast on the local and European elections that’s good news for SF and Ind/Others. So so news for FF and not good at all for FG and LP. 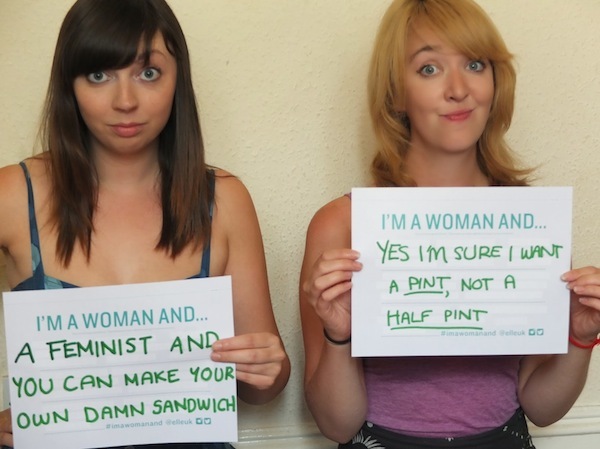 Posted by WorldbyStorm in Feminism. For the November issue of women’s magazine ELLE UK, agency W+K London teamed up with feminist cofounders of Vagenda, Holly Baxter and Rhiannon Lucy Cosslett, to rebrand feminism. And that’s an interesting project in itself which raises many issues – does feminism need to be rebranded, what would such an exercise actually constitute or achieve and of course certain contradictions, not least the use of corporate media, advertising and so on in relation to advancing feminism. One commentor in comments beneath the piece noted some of the materials produced are great, but pink as a colour in one piece (and more on that issue again)? And the image from the piece that resonated? Here it is. The sign on the right brings back an experience from last Summer in the UK. Sitting in a restaurant/bar a male waiter/manager commented negatively on a woman in the group I was in for having a pint instead of a glass (or ‘half’), something along the lines of ‘a glass of wine for the lady’; ‘no thanks, I’ll have a beer’; ‘I’ll bring a half over’; ‘No thanks, I’ll have a pint’… cue an expression of obvious disdain bordering on distaste and a muttered comment. Add to that at the end of the meal the term ‘we know who is wearing the trousers’ in relation to a brief discussion as to who was paying a bill and it surely underscores what the expectations of some men are. Perhaps that was unusual, perhaps my experience – and that of those I was with – is atypical, but having been in a number of places in England and Wales across that period I’m not so confident about that. Posted by WorldbyStorm in 1913 Commemoration Committee (1993). There is a Family History Day in Pearse Street Library, Dublin tomorrow from 9.30 am until 4.15 pm. Of particular interest will probably be how to search First World War Records at 10 am by Conor Dodd and how to search Military Pensions Collection, by Commandant Padraic Kennedy at 2.45pm.